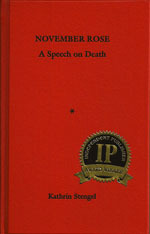 "... this book of consolation [is] amazing in its philosophical purity ..."
"... the most excellent book on grief I have read ..."
In this penetrating, thought-provoking, and deeply personal philosophical meditation on the death of the beloved other and the turmoil into which it throws those who were close to him, philosopher Kathrin Stengel opens hitherto unseen vistas onto one of the most painful human experiences. The author's ruthless clarity of observation, coupled with razor-sharp philosophical intuition and unflinching honesty of judgment, allows her to pinpoint the personal and social complexities of life after death in a way that cannot but make us doubt some of our common practices in dealing with death and survival. "Dr. Kathrin Stengel has written the most excellent book on grief I have read. And I have read almost all the grief books I could find. November Rose is unique among grief books because it is more truthful than most and because it speaks for the survivors of death ... All widows and widowers and other survivors of a great love will relate to the writing of this book. Best of all, survivors are given, in the last two chapters, a guide to finding their way back into life again." "... exquisite, eloquent, and beautifully thought through. It's philosophy as meditation." "... November Rose: it is a treatise of such conceptual density that it seems to reveal itself to the reader only gradually and in spurts. I have read it in one sitting, but that was a mistake. Now it is sitting on my desk, on cer-tain days I open it and read a couple of pages – that’s much better. The ideal reading pace for this book would probably be about three sentences per day – only in this manner can this amazing book of consolation (amazing in its philosophical purity) achieve its full impact. What I mean is the subtle sense of vertigo in reading it: the reader is drawn into reflections about the inevitable, as if it had already long happened. And, indeed, it has – and not only for the one whose voice we hear in this book, but for each of us, who listen closely ..."
"Kathrin Stengel has landed a coup. She has succeeded in elevating the personal and intimate to the level of the universal - in writing a book that is crystal-clear and understandable, while being emotionally persuasive and inviting its reader fully to open herself to it. Her ruthless analysis and sober assessment of our dealing with survival and death notwithstanding, Kathrin Stengel has also written a story that is simply the story of a great love." "Kathrin Stengel has written on the death of the other and how to understand the fact of that death without resorting to feel good pyscho-babble or self-improvement moralizing ... in a language as clear as reading Cioran or Unamuno ..."
"I don't think that thoughts such as these have ever been articulated before. November Rose: A Speech on Death is not only utterly original, but, more important, it taps into our very roots - and this is, by all counts, something very rare indeed in our discourse-ridden and existentially impoverished age. It is truly a profoundly beautiful book." "November Rose is a beautiful book. I can only agree that having seen death that close (watching, holding and kissing the dead person you love so much) changes you for ever and probably for the best." "I read your book and found it more than wonderful. You really project clear-headedness, happiness and a remarkable lack of anger (and other negative feelings). Excellent!" "Yesterday, I reread the beautiful November Rose for the second time. This book is not only beautifully written, but written with honesty and emotional purity. It is, on the one hand, a story about love and life, and, on the other hand, a story full of sadness and grief. It invites deep thinking and empathizing." "I truly cannot adequately express in words what a profoundly moving, engaging, intellectually rich and inspiring experience reading November Rose has been ... As a fellow philosopher I am indebted to Kathrin Stengel for broadening my horizons, for illuminating parts of my own experience in this precious world, and for challenging me to rethink certain concepts and to deepen my understanding of them." "This speech gets under your skin. A beloved's premature death is an inexorably tragic event. With philosophical precision and utmost poetic force, sustained by a profound and all-encompassing sense of humanity, Kathrin Stengel transports the reader into the very depths of this event and guides him through it. 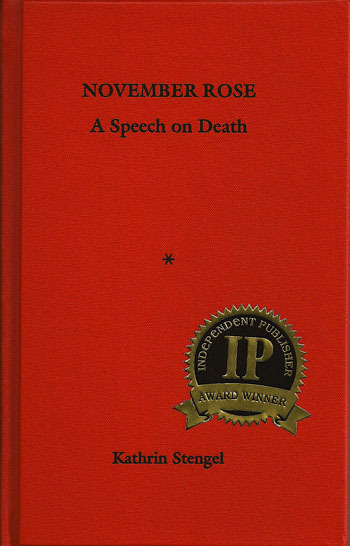 This speech builds bridges - between life and death, as well as between reader and author. It is imbued with the love of life in its entirety - a love that is capacious enough to contain even death itself. This speech is written with the eyes of the heart. It is indispensable reading." "After rereading November Rose: A Speech on Death I had to read it again - for the third time ... and not because I am slow to understand - no, it's because with every new reading, I discover new things in this book. I have to admit that initially I hesitated to pick up the book, as I was somewhat scared to confront the topic of death. Now, however, that I have read and reread it several times, I feel that could write endlessly about it, analyzing, probing, interpreting it ... but I'll make it short: it is a wonderful book! What I find most amazing is that each sentence fits like a glove: there nothing superfluous or artificial about it ..."
"It is a must read for everyone who has lost a partner. I lost my husband 2 1/2 years ago to colon cancer and reading this book has confirmed a lot of my feelings and thoughts. It is very helpful for those who lost a partner and are in a new relationship." "... an immense help ... incredibly valuable ... beautifully written ..."
"I read November Rose: A Speech on Death and couldn't put it down. I would like to thank the author from the heart. I am deeply touched, deeply moved. It is an intelligent and humane speech. It shows a rare combination of mind and heart. This book gives me courage to transform suffering into strength, to say yes to life, and to learn to see our singularity as human beings." "I read November Rose one afternoon in London over the New Year holiday. I found the book deeply thought provoking. For me it said so much about grief. I have not experienced this kind of grief personally, but have a very close friend who went through ... similar experiences ..., although at a later stage in his life. The same issues and emotions swirled around him. The same attitudes of others. But I thought that the book said as much about the nature of loving as it did about death, as I know it was meant to." "Its gentle and allusive manner stirs up feelings that are hard to name and yet allow one to cry with relief for having recognized them." "... feels like a volume of poetry that one would like to peruse off and on. Its contents: observed with precision, beautifully articulated, structured with clarity. Simply stunning! And moving to the core ... immensely valuable for my psychotherapeutic work ... "
"... a great speech that puts everything into the right perspective." "... a consummate love song, an unstoppable battle cry of true passion ... powerful and mercilessly truthful ..."
"... a true and beautiful book. Anyone who reads it will be strengthened by its honesty, wisdom, and capacity to affirm life ... This seems to me a very Jewish book in its love of life and living fully ... not to speak of its intellectual clarity. It is rare for a book to combine philosophy and poetry (prose poetry) so very happily ..."
"It is a wonderful book." "November Rose: A speech on Death should be a required reading before you go to a funeral home or before you meet someone who has lost a beloved."